The New Document dialog box appears. You use it to determine the new document’s profile, size, measurement unit, color mode, and page orientation as well as the number of artboards (pages) you want in the document. 2Enter a name for your new file in the Name text field. You can determine the name of the file now or later when you save the document. 3Choose a profile from the New Document Profile drop-down list. 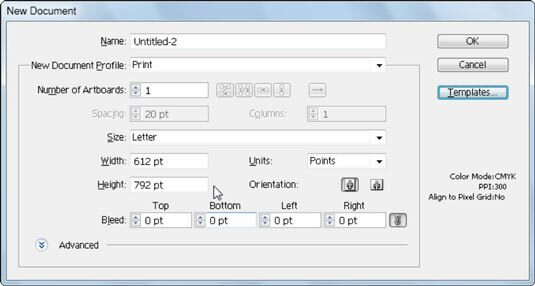 Selecting the correct profile sets up preferences, such as resolution and colors, correctly. Click the Advanced down arrow (in the lower left corner of the New Document dialog box) to see which settings are selected for each profile and to change them if necessary. 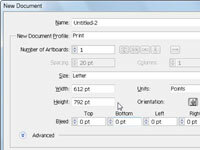 4In the Number of Artboards text box, enter the number of artboards you want in the document. If you want a single page document, leave this setting at 1. 5Enter in the Spacing text box the amount of space to leave between artboards. If you want pages to abut, enter 0 (zero), or enter additional values if you want a little space between each artboard. If you’re adding artboards, you can enter in the Columns text box the number of columns of artboards you want arranged in the document. 6Choose from the Size drop-down list or type measurements in the Width and Height text fields to set the size of the document page. You can choose from several standard sizes in the Size drop-down list or enter your own measurements in the Width and Height text fields. Note that several web sizes are listed first, followed by other typical paper sizes. 7Choose from the Units drop-down list to select the type of measurement you’re most comfortable with. Your selection sets all measurement boxes and rulers to the increments you choose: points, picas, inches, millimeters, centimeters, or pixels. 8Pick the orientation for the artboard. The artboard is your canvas for creating artwork in Illustrator. You can choose between Portrait (the short sides of the artboard on the top and bottom) and Landscape (the long sides of the artboard on the top and bottom). 9Add values in the Bleed text boxes, if necessary. A bleed value is the amount of image area that extends beyond the artboard. To print from edge to edge, enter a value for the bleed. Keep in mind that most desktop printers need a grip area that forces any image area near the edge of a page to not print. Bleeds are typically used in jobs to be printed from a press. 10When you’re finished making selections, click OK.
One or more Illustrator artboards appear. The document size and color mode may need to be changed later. You can change them by choosing File→Document Setup and making changes in the Document Setup dialog box. Need a design boost? Try a template. In the New Document dialog box, click the Templates button to get a jump-start with professional designs precreated as Illustrator templates. Start with a simple template for a CD cover, like below, or start your brochure, business cards, or flyers with a template that includes imagery, text, and professional layouts. Precreated templates lead to successful designs.